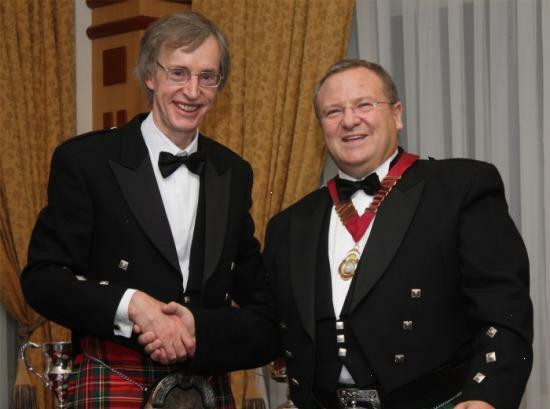 Thurso Glassblower, Ian Pearson recently stepped down as Chairman of the British Society of Scientific Glassblowers after holding the post for the last seven years. He was the longest serving Chairman of the BSSG since its formation in 1960 and in recognition of this Ian was presented with Honorary membership of the Society. Ian is only the third glassblower to receive such a prestigious award. The event took place at the Beardmore Hotel and Conference Centre, Clydebank last week where near sixty glassblowers from around the world took part. Ian gave one of the many lectures focusing on the glass work he has done at DSRL in recent times. For the last nineteen years Ian's artistic glass work as been focused form his studio on Riverside Road in Thurso.